Is your kitchen practical but just a little bit dull? 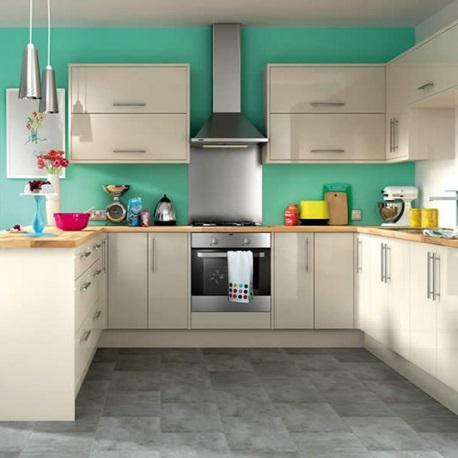 Why not make the most of your existing kitchen and save some cash! Below are a few clever tricks that can resuscitate an exhausted, time worn kitchen whilst avoiding a five-figure bill. One of the best ways to give your kitchen a new lease of life is to update the kitchen cabinet doors. Given the cabinets are structurally sound, a fresh coat of paint or varnish may be all that is needed to bring them back to life. If the doors are totally tattered they can always be replaced, most of the time the shell of the kitchen is perfectly useable. If there is nothing drastically wrong with the kitchen units and cabinets, your cheapest option is to fit new handles. Wooden button knobs suit country kitchens while chrome bar handles add an urban edge. Deliberate carefully about which look is right for you, panelled doors create an old-style effect while flat front doors look more modern. Visually noticeable but small enough not to need much material, the wall space above the worktop and below the top cabinets is a great place to add colour. Glass splashbacks are eliminating tiles, creating a trendy, clean cut and fresh look, they can be painted to any colour so you can create something truly unique. While most think of the kitchen as a primarily functional space, kitchens today are much more than a place we cook food. The kitchen of today serves many purposes; often acting as the main family living space, a play area, informal dining room and home office all in one single day. Thinking about it, all these tasks are carried out on the worktop of your kitchen and on this basis it can be said that the kitchen worktop is a key feature in any home, let alone kitchen. Stone worktops are the way forward, they are simply a fantastic investment. Not only do they add value to your home, their beauty and durability is incomparable to any laminate worktop. With a variety of Marble, Granite and Quartz available in today’s market you can create almost any look. Kitchen appliances are often the costly element of designing a new kitchen, if your old ones are in good shape, consider reinstalling them into the new design or replacing those that are on display (such as the hob). If you do need to buy appliances, ensure that you research the high street and internet for price comparisons as there are some great deals. A key way to create a modern feel is to wall mount your kitchen appliances, this will give the kitchen an overall sleek and tidy vibe. Now that we have worked on the worktop and doors it’s time for the fun bit! What are you going to put on the worktops to pull the whole thing together? From light fixtures to the cutlery in the draws, adding small colourful touches throughout your kitchen can really bring it all together. A bright bold toaster and kettle sat on your kitchen worktop can create a more vibrant feel than typical stainless steel appliances. This article was posted in Guest Posts, Kitchens. Bookmark the permalink. Follow comments with the RSS feed for this post.Post a Comment or leave a trackback: Trackback URL. A very informative article to read.Thanks a lot for posting this.Good Work.Keep posting more articles like this.